The Endless Love Ring, with it's unique alternating heart design, offers an exciting new style to personalized mother's jewelry. It is available in your choice of 10K or 14K, yellow or white gold. 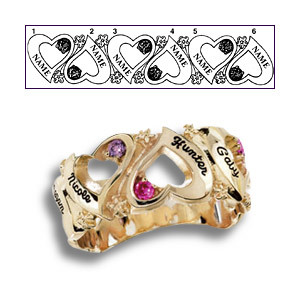 It can be personalized with 0-6 names and corresponding birthstones. When synthetic birthstones are selected, blank ribbons will be accented with a CZ. White sapphires will be used when genuine birthstones are selected.